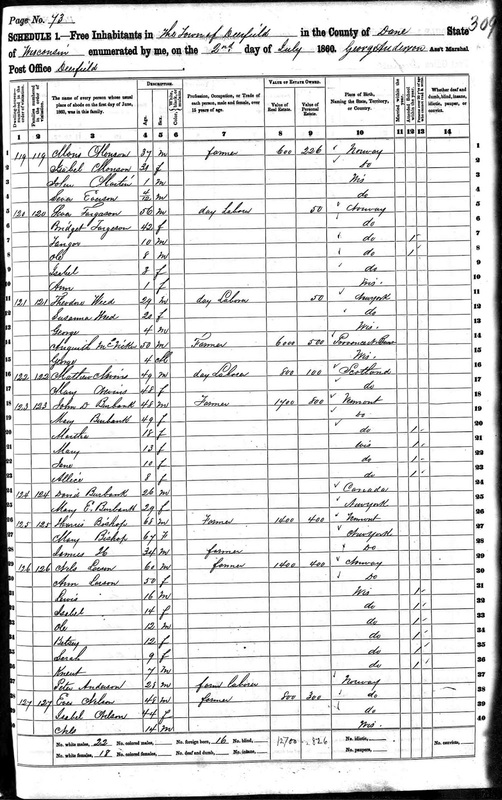 1860 United States Federal Census, Dane County, Wisconsin, Population Schedule, Deerfield Township, Page 309 (penned), Dwelling #121, Family #120, Sever Torgason household; digital image, Ancestry.com (http://www.ancestry.com); citing National Archives Microfilm Publication M653, Roll 1403. This is the family of Sjur Torgersen (1804-1889) and his wife Brita (Olsdtr) Torgersen (1818-1895). The family came to America in about 1857, and settled in Deerfield, Dane County, Wisconsin. The census enumerator used Anglisized names for them - Sever for Sjur, Bridget for Brita. The children were enumerated with the Torgason surname. 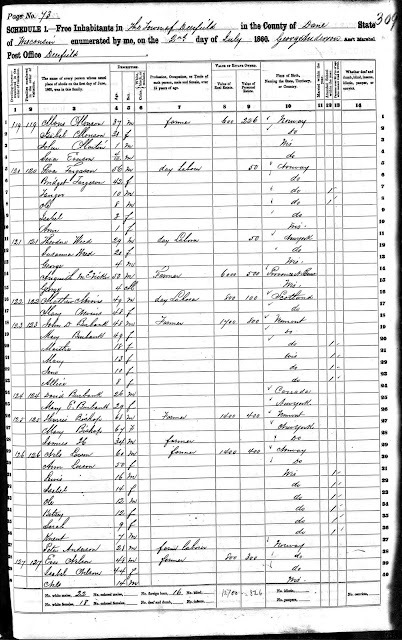 Sever Torgason was actually enumerated as Seva Forgason on Ancestry.com because of the penmanship of the enumerator. Sjur and Brita took the Leland surname in the 1870s, and are Linda's 2nd great-grandparents. She is descended through the eldest son, Torger Sjursen Leland (1850-1933), who married Anna (Ellingsdtr) Natvig (1853-1911).